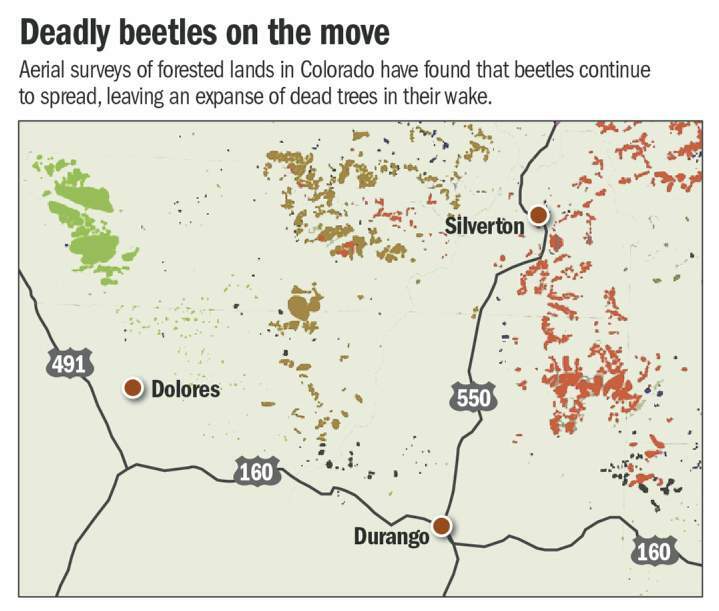 As beetle kill spreads, will the drive from Durango to Silverton resemble Wolf Creek Pass? 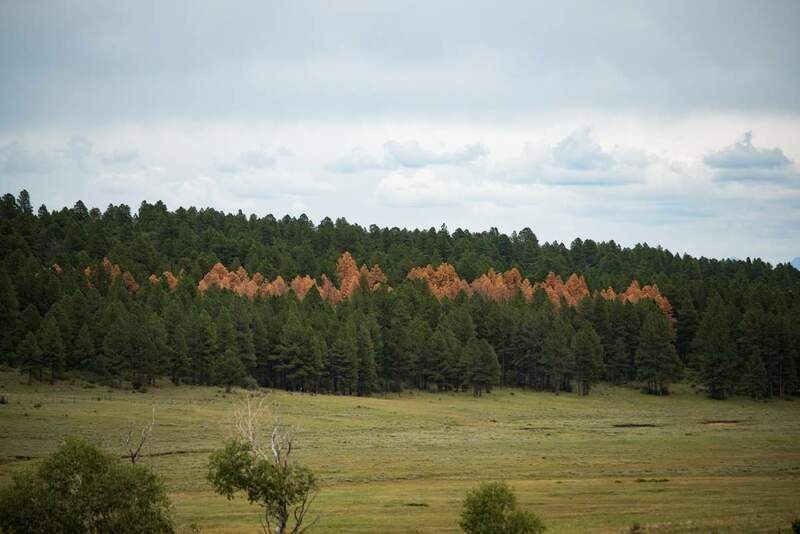 Forest researchers have noted that the spruce beetle has started to kill more trees in the U.S. Highway 550 corridor between Durango and Silverton. Forest researchers say that although spruce and roundheaded beetles are native to Colorado, the insects’ rapid spread has been exacerbated by drought, warmer winters and dense forests. The Colorado State Forest Service and the U.S. Forest Service are planning a broad-scale tree-thinning project, especially in areas around the Glade outside Dolores, to help slow down beetle kill. Beetle kill is spreading farther west into the San Juan Mountains and now dropping down into the corridor between Durango and Silverton, according to a new report from the Colorado State Forest Service. 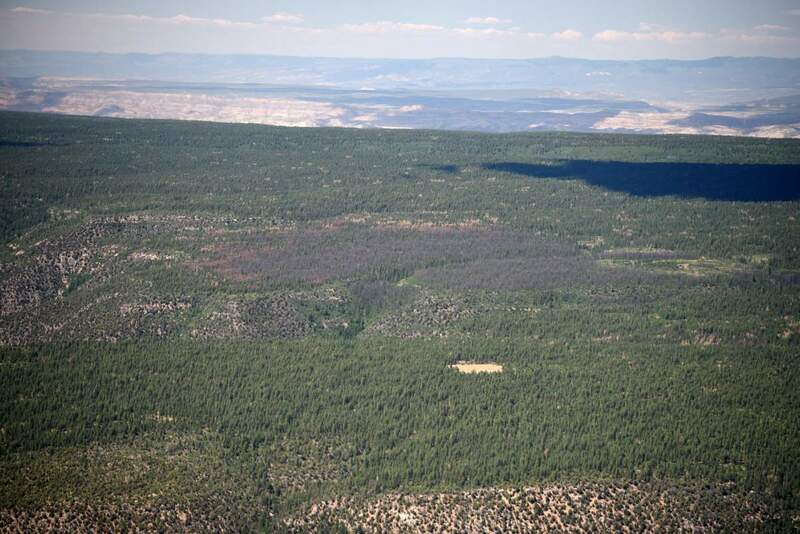 Every year, the Colorado State Forest Service, in conjunction with the U.S. Forest Service, conducts an aerial survey over most of Colorado’s estimated 24.4 million acres of forested lands, tracking new areas where beetle kill has spread. In Southwest Colorado, two major, and potentially drastic, observations were noted. The first: The spruce beetle, working its way west from Wolf Creek Pass, is dropping down into the U.S. Highway 550 corridor north of Durango, as well as into areas around the high country in Silverton.The second: The roundheaded pine beetle is ravaging ponderosa pines near Dolores at an alarming rate. From 2017 to 2018, the total area impacted shot up from 11,000 acres to 27,000 acres. Spruce beetleThe spruce beetle epidemic started on Wolf Creek Pass in the late 1990s. Though native to the land, the insect’s toll was exacerbated as drought, warmer winters and dense forests created perfect conditions for rapid spread. Over the past nearly two decades, the spruce beetle tore through more than 120,000 acres of the Weminuche Wilderness, which at almost 500,000 acres, is Colorado’s largest designated wilderness area. 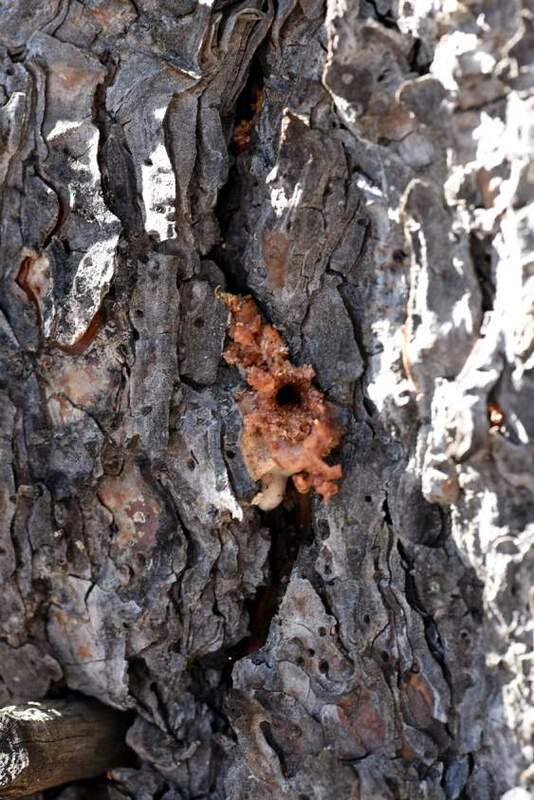 In more recent years, the spruce beetle has chomped through trees farther west in the Weminuche, around Vallecito Reservoir. The insect eventually was able to cross over the eastern flank of the continental divide in the past couple years. Now, forest researchers are noting more and more pockets of dead trees along the scenic drive between Durango and Silverton on U.S. Highway 550. 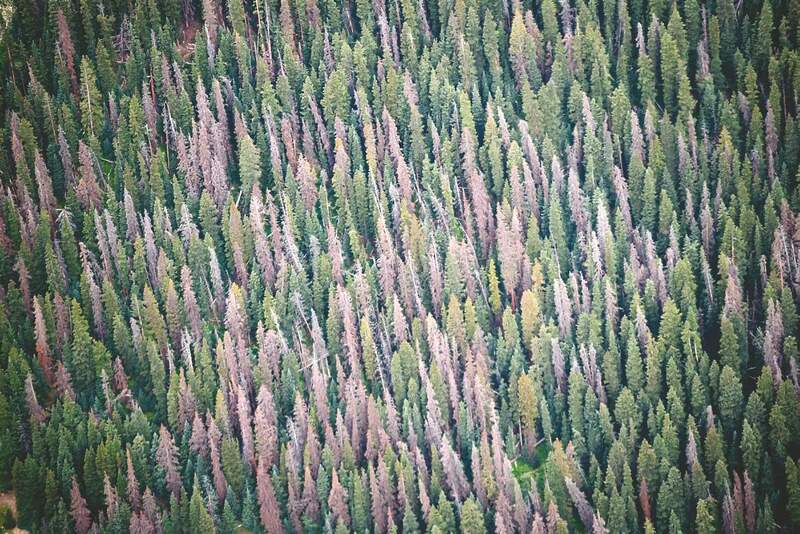 Dan West, an entomologist with the Colorado State Forest Service, said a total of 13,000 acres of newly affected trees were noted in this year’s aerial survey in La Plata County – the third highest in the state. In San Juan County, an estimated 6,000 acres of newly affected trees were documented. For both these counties, a total of 66,000 acres has been hit by the spruce beetle outbreak since 1996. It’s been a perfect storm for the beetle’s spread in Southwest Colorado. 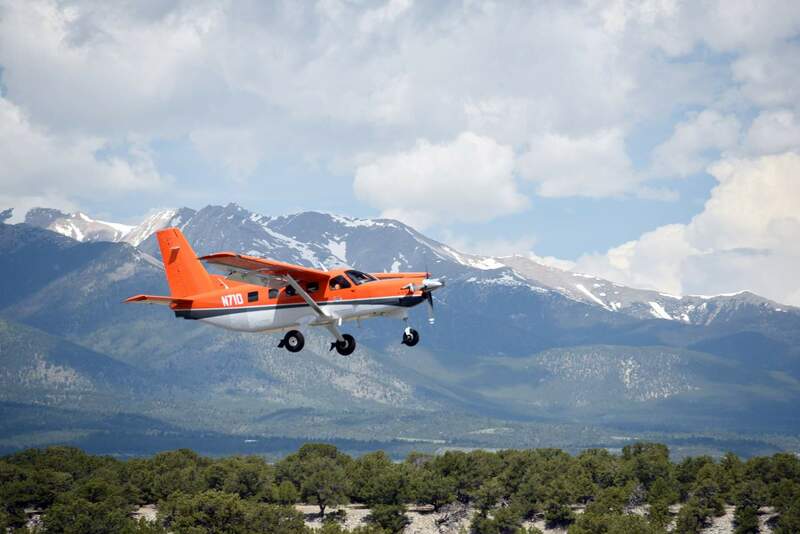 Every year, the Colorado State Forest Service with the U.S. Forest Service conducts an aerial survey of Colorado’s 24.4 million acres of forested lands, looking for new areas of beetle kill. Drought weakens a tree’s ability to fight off the insect. With warmer winters, more beetles are able to survive the cold months. And dense forest stands allow beetles to travel with ease. For the most part, it’s hard to do anything proactive to stop the outbreak, West said. Most areas affected are in steep, difficult terrain. So outside some spots where tree thinning makes sense, logging is largely not feasible. So, will the drive from Durango to Silverton get as bad as the stark beetle kill vistas on the drive over Wolf Creek Pass? Culpepper said people who live here and enjoy the mountains should brace themselves for change. “Anyone driving 550 will start noticing dead stands this year … and that will be a big shock to folks,” he said. Culpepper said he’s noticed other areas of beetle kill farther up in the high country around Silverton, in areas around the upper Animas River, Stony Pass and in Maggie and Minnie gulches. Seeing the places we love change and trees die can be emotional, he said, but it’s important to keep it in perspective. Roundheaded beetleWhat’s happening to ponderosa pines outside Dolores is concerning, shocking and a bit of a mystery. Forest researchers first noted roundheaded beetles killing ponderosa pines in an area north of Dolores, known as the Glade, as early as 2011. Every year, West said, the acreage affected has doubled. The roundheaded beetle is ravaging ponderosa pines outside Dolores in an area known as the Glade. The affected area totals an estimated 27,000 acres. But in the past two years, the beetles’ impact has shot up. An estimated 11,000 acres were affected in 2017. That number increased to 27,000 acres in 2018. “It’s at an exponential growth rate right now,” West said. What’s driving this unprecedented spread is still unknown, but most suspect it is driven by the drought in Southwest Colorado. The roundheaded beetle ranges from Guatemala to the Rockies, so the insect is native to this region. But in New Mexico, for instance, the beetle builds up over a year or two and then experiences a population die-off. Researchers believe the drought in Southwest Colorado is paving the way for these beetles to thrive. Last year, for example, was the warmest year on record dating back 124 years, and the second driest year dating back to 1895. West said the Colorado State Forest Service and the U.S. Forest Service are putting together a broad-scale tree-thinning project to help save trees where it’s possible and try to reduce wildfire danger. The Durango Herald was unable to reach anyone with the U.S. Forest Service because of the partial government shutdown. Despite all the seemingly doom and gloom news, West did offer one optimistic tidbit about the beetle outbreak in Colorado. Of Colorado’s 24.4 million acres of forested land, only 21 percent has been affected by beetle kill since 1996.